Bruxism (the proper term for habitual teeth grinding) doesn’t discriminate between patients. Men and women, children and adults – everyone can be a potential victim for this unpleasant bad habit. While many patients grind throughout their day and are actively working towards correcting their condition, others don’t even realize what’s happening to their smiles. This is because bruxism is most likely to occur when people are asleep. At J.B. Dental, Dr. Bancroft and the rest of our team will keep a close eye out for symptoms of bruxism during regular dental checkups. 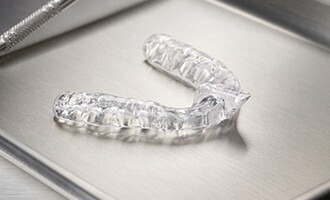 Treatment options are available as needed to put a stop to this gradual damage, including custom-made nightguards that provide optimal protection as patients rest easy until morning. Please don’t hesitate to contact our Westminster, CO dental office today if you have any questions, or if you’re ready to schedule a visit. After we’ve determined that a patient is suffering from bruxism, the next step is to determine the treatment plan that will fit their circumstances best. In mild cases, facial relaxation, stretches, and anxiety management techniques may be enough to stop the damage. However, what we will most likely recommend is a customized nightguard. This type of oral appliance is designed to be worn to bed, and it creates a sturdy physical barrier between the rows of teeth. As a result, they are no longer able to meet in harmful ways. Unlike a “one size fits all” nightguard from the store, Dr. Bancroft can design a high-quality, personalized model that fits each unique patient’s smile very comfortably.